“Does the money come out of your computer?” my daughter asked after I explained to her that I work from home and that’s how I make my money. Over the years, my daughters and I have had various discussions about money – from how I earn it and what we spend it on to how and where we save it. 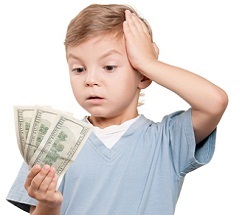 The topic of money is full of interesting and practical lessons for our kids. One fun way to approach learning about money is to dig into history. For example, have your child pick a country and explore its currency: How did a particular country’s money originate (e.g., the Euro)? What did it look like then and how has it changed? Another great topic, not to mention a crucial one as children become teenagers, is the credit card. What were the first credit cards? Why were these created? Then in the meantime, kids can also learn how credit cards work and, while although handy, can lead to a great deal of financial trouble. A practical lesson with money that ties in with math is money calculating. At school, your child probably has or will learn about how much each coin and bill represents in cents. You can help reinforce this lesson by having your child use his or her own money when they go out to buy something. Also, you can do some “change games” with a pretend store, marking the items with different costs and having your child add together the items’ prices, then handing you the correct change. The money lesson wouldn’t be complete without discussions of personal financial responsibility. According to Janet Bodnar, Editor for Kiplinger’s Personal Finance, “A recent survey shows that parents in the U.S. spend less time talking with their children about financial issues than parents in other countries do.” Because we admittedly live in a consumerist society equipped with credit cards and continuous “blue light” temptations, it’s all the more important to start young with our kids, helping to teach and guide them through the meaning of money – saving and spending it. Some of the talks can be deliberate, direct ones. What should you do with the birthday money you received? What’s a budget? Why should you save money? It’s also a great idea to open up a savings account for your child when you feel they’re old enough to understand. They will be satisfied to take their money to the bank each time and see the amount of money grow as they regularly make deposits. Other money lessons are more subtle. Before you go to the grocery store with your child, study the weekly ad with them and gather your coupons for your purchases. When you’re at the market, do some price comparisons with your child and let them help you figure out the best deals. You can also use this opportunity to discuss things like: Why is $9.99 really more like $10 and not $9? Why is it best to buy certain fruit when it’s in season? Why is it not always the best idea to “impulse” buy at the cash register? If your child grows up with these habits and an awareness, they’ll be more likely to practice them themselves as they start shopping on their own. Of course, although the ultimate goal is to instill in your child the importance of saving and not overspending, they should also develop a practical sense for when it’s OK to spend and then how to spend. For example, if there’s a certain item they have been wanting, help them to save their money, exercise patience and restraint, and then shop around for the best option. Another lesson learned is that many of the joys in life are actually the things that cost little to nothing: Writing a letter or email to a friend or family member, taking a walk in your neighborhood, playing a board game with your family, camping in your backyard or bedroom … the possibilities are endless. But when the time does come to buy something, it’s always great to hear kids ask “Is it on sale?” Music to our ears.